As medical imaging evolves, the constantly improving images offer more clinical information than ever before. For example, the capturing of numeric data that quantify the dimensions of structures seen on images, such as lesions, can be useful to referring clinicians. However, tools for gathering and translating these data for clinical purposes can be difficult to find because they aren’t widely available. Despite the difficulties, tools that provide quantitative measurements will become increasingly important for patient care as value-based care takes hold. Bradley J. Erickson, MD, PhD, a radiologist at the Mayo Clinic, says radiology, as a specialty, is only beginning to tap the potential of quantitative measurements. He spoke at the 2014 Society for Imaging Informatics in Medicine (SIIM) annual meeting about their value and why radiology needs to look at them more closely. The most common radiology measurements are for tumors, such as the Response Evaluation Criteria in Solid Tumors measurement, but most of these only measure one dimension, although there are some multidimensional measurements for vascular imaging and one for epilepsy. Erickson says the reason most measurements are done in one dimension is because they’re easier to interpret. He adds that tools that measure multiple dimensions generally aren’t user friendly, and a lack of tools that make good measurements relatively quickly is a significant barrier to their clinical adoption. Another barrier is the amount of work involved in developing a quantitative measurement tool. For each measurement, the tool has to be validated before it can be implemented into a PACS. 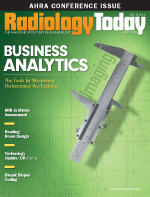 Erickson says the good news is that government institutions, such as the National Institutes of Health, and medical societies, including RSNA, are beginning to focus more on quantitative imaging. He believes this increased attention will help drive validation efforts. Better reporting is necessary as well. Erickson says there’s relatively little structured data available, which makes reporting difficult. Although there has been some work done with ultrasound scanners recording obstetric results in the DICOM Structured Report format, which can be directly reported to a RIS, work of that nature is in its very early stages. Usually, the radiologist has to dictate the results into the RIS, increasing the possibility of speech recognition and formatting errors. Standard formatting also would make it easier for vendors to add these tools to their offerings. DICOM SR is one possible format; Annotation and Image Markup is another. Erickson says the radiology community needs to decide which of these methods is most useful and develop accompanying templates. He believes SIIM may take the lead on this issue. Quantitative imaging also will allow clinicians to develop a deeper understanding of what disease looks like, how it behaves in the body, and how to treat it. Erickson says the definition of knowledge that Robert Kiyosaki puts forth in his book Rich Dad, Poor Dad—the ability to make distinctions—describes quantitative imaging’s potential well. He says clinicians will be able to use quantitative imaging tools to make ever more subtle distinctions between sets of medical image data.